Hypereosinophilia is a frequent symptom that may occur in course of many underlying diseases. Hypereosinophilic syndrome (HES) is characterized by following criteria-Eosinophil count greater than 1500 μl persisting longer than 6 months and single or multiple organ system dysfunction attributable to cytotoxic injury by eosinophils without an identifiable etiology to explain eosinophilia. 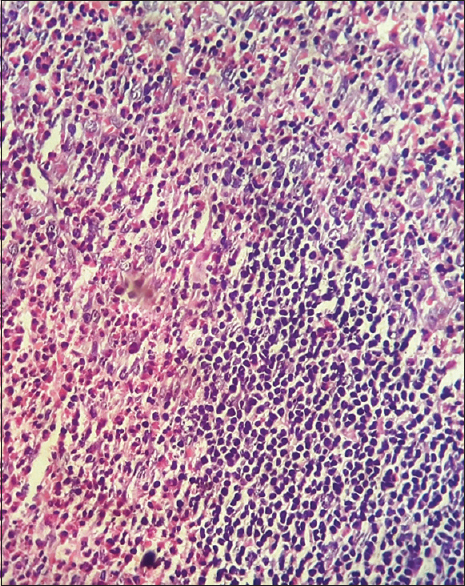 We present a case of HES with peripheral eosinophilia showing eosinophilic infiltration in lymph node. In an eleven year old boy who presented to Respiratory medicine OPD with intermittent fever and papular skin rashes. Idiopathic hypereosinophilic syndrome (HES) represents a heterogeneous group of leuko proliferative disorders associated with prolonged eosinophilia of undetectable cause with multiorgan system dysfunction. In this, the eosinophil count should exceed 1.5 × 109/L, persisting for at least 6 months unless death intervenes and there should be no evidence of eosinophil clonality. As there is no specific test for HES, it is a diagnosis of exclusion. It is a rare disorder in children. Most of the cases have been reported in women aged 20–50 years. Target organ damage mediated by eosinophilia is highly variable with the involvement of heart, skin, lung, central, and peripheral nervous system. Isolated involvement of lymph node is not documented. We present a rare case of idiopathic HES presenting with lymphadenopathy in a young child. 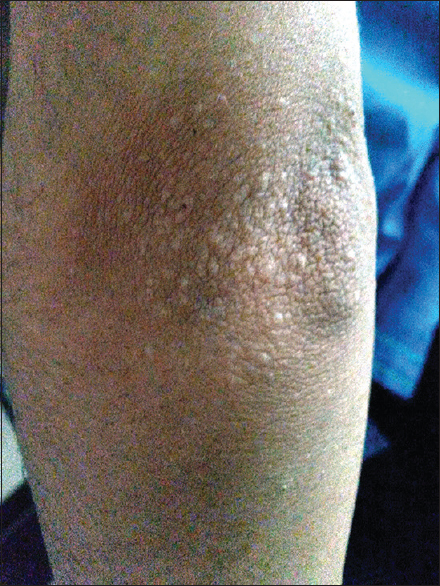 A 7-year-old boy presented with complaints of intermittent fever, headache, body ache, itchy papular skin rashes with cervical and axillary lymphadenopathy since last 2 years [Figure 1]. Figure 1: Child with skin rashes on left elbow. No history of dyspnea, orthopnea, wheezing, joint pains, oliguria, anuria, worm infestation, or allergic disorders. The child was initially treated by prednisolone after which he became asymptomatic. Multiple enlarged lymph nodes including right cervical and bilateral axillary region lymph nodes varying in size from 1.0 to 1.5 cm. Normal hemoglobin (13.6 g/dl), raised total leukocyte count (58,700/cumm). Absolute eosinophil count (AEC) was 49,308/cumm. Peripheral blood smear showed eosinophilia [Figure 2]. Bone marrow aspiration and biopsy were hypocellular (overall cellularity 30%–40%) with a mild increase in eosinophils and its precursors. Erythrocyte sedimentation rate and C-reactive protein levels were unremarkable. Figure 2: Peripheral blood film revealing eosinophilia. Liver and pulmonary function tests were unremarkable. Serum immunoglobulin E (IgE) levels were raised 1405 IU/ml (normal range 0–280 IU/ml). Antibody detection (enzyme-linked immunosorbent assay) for parasites including toxoplasmosis, hydatidosis, toxocariasis, and antigen detection for filariasis were negative. Serology for HIV, hepatitis B virus, hepatitis C virus, Epstein–Barr virus, and antineutrophil cytoplasmic antibody was negative. Negative for ß-hemolytic streptococci or Staphylococcus aureus. Negative for any parasitic ova/cyst. Chest X-ray and echocardiography were unremarkable. On the basis of these investigations, any underlying causes of hypereosinophilia were ruled out (including allergic and parasitic disorders, solid and hematological malignancies, Churg-Strauss disease). Fine needle aspiration cytology from right cervical lymph node showed a polymorphic population of reactive lymphoid cells with interspersed atypical lymphoid cells in a background of lymphoglandular bodies [Figure 3]. 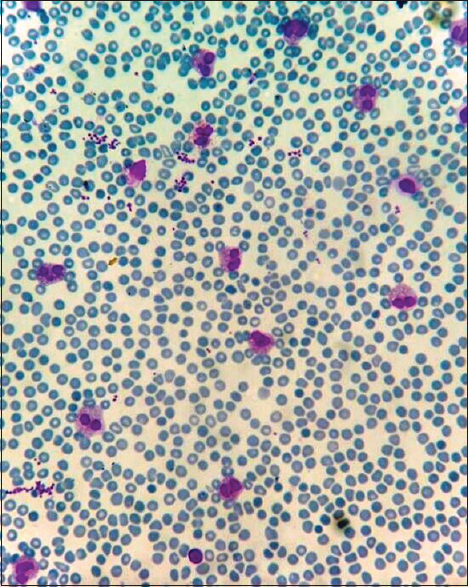 Figure 3: Smear showing a polymorphic population of lymphocytes with scattered occasional atypical lymphoid cells (L and G, ×400). Partially maintained architecture of lymph node with reactive follicles and sinus histiocytosis. 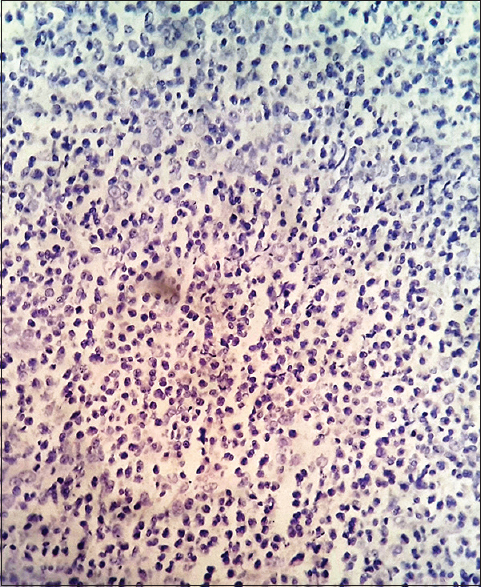 A portion of lymph node showed heavy infiltration by sheets of eosinophils with scattered histiocytes. No granulomas were seen [Figure 4]. 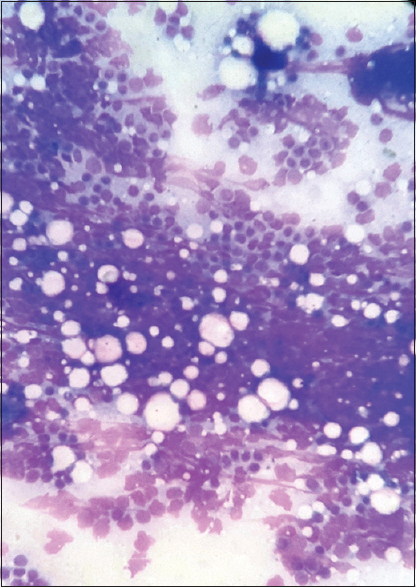 Figure 4: High power view showing partially maintained architecture of lymph node revealing heavy infiltration by eosinophils (H and E, ×400). On the basis of histology, various differential diagnoses were considered such as Kimura's disease, dermatopathic lymphadenitis, langerhan's cell histiocytosis (LCH), Hodgkin's lymphoma (HL), and angioimmunoblastic T-cell lymphoma (ATL). The absence of any prominent vascular component ruled out Kimura's disease and ATL. Dermatopathic lymphadenitis was excluded on the basis of the absence of any pigment laden histiocytes in the paracortex. 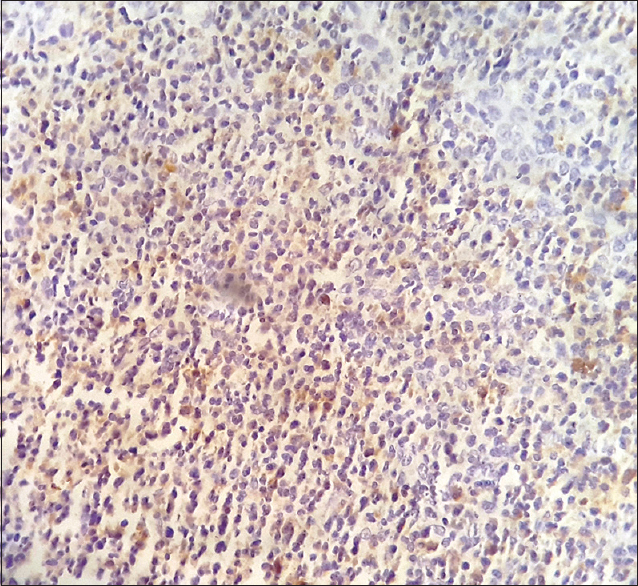 Immunohistochemistry (IHC) was performed to rule out LCH and HL. CD1a and CD30 were negative while CD15 was positive in granulocytes. No RS cells were seen [Figure 5],[Figure 6],[Figure 7]. Figure 5: High power view showing CD15 positive granulocytes (immunohistochemistry, ×400). Figure 6: High power view showing a negative CD30 stain (immunohistochemistry, ×400). Figure 7: High power view showing a negative CD1a immunostain (immunohistochemistry, ×400). 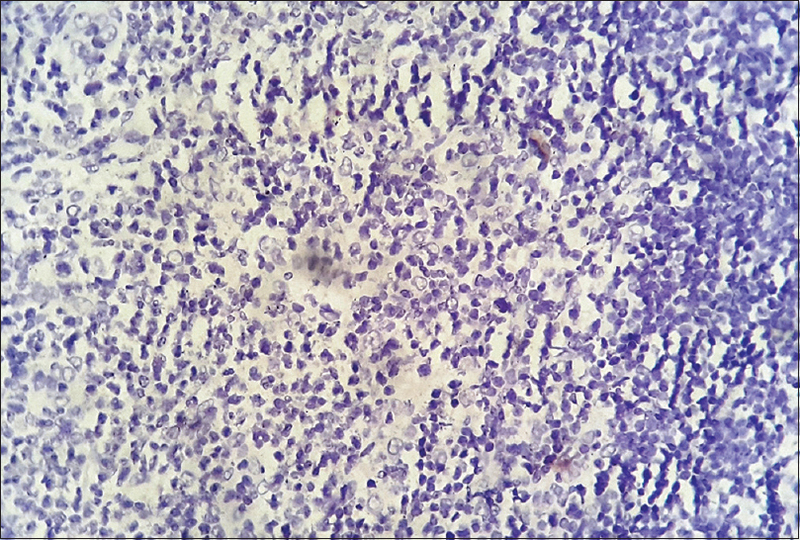 On the basis of morphology and IHC, a final diagnosis of eosinophilic infiltration in lymph node in a case of HES was made. The child was put on prednisolone (1 mg/kg/day) and followed up after 6 months with complete hemogram including PBF examination. AEC was found to be markedly decreased. The procedures followed were in accordance with the ethical standards of the responsible committee on human experimentation. The ethics committee approves of the study, and informed consent was taken from the child. The HESs working group reached a consensus in 2005 and divided the heterogeneous group of chronic eosinophil-mediated disorders into six subgroups., FIPL1-PDGFR associated HES, chronic eosinophilic leukemia with increased blasts, lymphocytic HES with reactive eosinophilia, myeloproliferative-HES, organ-restricted eosinophilic disease and idiopathic HES. Myeloproliferative-HES is characterized by clonal expansion of myeloid lineage, dysplastic eosinophils in peripheral blood, and normal IgE levels. Most patients have anemia, thrombocytopenia, increased serum B12 levels and splenomegaly. In lymphocytic HES, multiple organ systems are usually affected, but cardiac involvement in the form of endomyocardial fibrosis, valvular diseases, and congestive cardiac failure results in significant morbidity in children. Diagnosis of HES relies on observation of persistent and marked eosinophilia responsible for target-organ damage and exclusion of underlying causes of hypereosinophilia (including allergic and parasitic disorders, solid and hematological malignancies, Churg-Strauss disease, and human T-lymphotropic virus infection). The initial step in our case was to exclude all known causes of HES. Various immunological tests were done to rule out any parasitic infestation. Various hematological malignancies described above were considered. PDGFR rearrangement is required to know eosinophil clonality. Finding more than 2% of blasts in peripheral blood would correspond with clonal hypereosinophilia. In bone marrow, signs of dysplasia in all lineages with an increase in a number of blast between 5% and 19% suggest clonal origin. Our case did not show increased blasts and no signs of dysplasia were seen in bone marrow. On the basis of histopathology, several differentials were considered as discussed earlier. Patient of HES is treated with prednisolone with an initial dose of 1 mg/kg. Although 70% of patients respond, few patients experience relapse. Hence, second line drug is given in the majority of cases including interferon-alpha or hydroxyurea. Our patient responded well to steroids. The reason can be the absence of cardiologic or neurologic dysfunction at onset. Complications of hypereosinophilia occur most commonly in the skin, lung, and gastrointestinal system. However, isolated involvement of lymph nodes is not documented. Hence, our case is a rare presentation. Chusid MJ, Dale DC, West BC, Wolff SM. The hypereosinophilic syndrome: Analysis of fourteen cases with review of the literature. Medicine (Baltimore) 1975;54:1-27. Venkatesh C, Mahender E, Janani S, Malathi S, Vijayakumar M, Nammalwar BR. Hypereosinophilic syndrome. Indian J Pediatr 2006;73:237-9. Bhatnagar S, Patwari AK, Narayan S, Lalit S, Anand VK. Idiopathic hypereosinophilic syndrome. Indian Pediatr 1999;36:824-7. Roufosse FE, Goldman M, Cogan E. Hypereosinophilic syndromes. Orphanet J Rare Dis 2007;2:37. Bain BJ, Gilliland DG, Horny HP, Vardiman JW. Chronic eosinophilic leukaemia, not otherwise specified. In: Swerdlow SH, Campo E, Harris NL, Jaffe ES, Pileri SA, Stein H, et al., editors. World Health Organization Classification of Tumours of Haematopoietic and Lymphoid Tissues. Lyon, France: International Agency for Research on Cancer; 2008. p. 51-3, 68-73. Cools J, DeAngelo DJ, Gotlib J, Stover EH, Legare RD, Cortes J, et al. A tyrosine kinase created by fusion of the PDGFRA and FIP1L1 genes as a therapeutic target of imatinib in idiopathic hypereosinophilic syndrome. N Engl J Med 2003;348:1201-14. Salomon J, Białynicki-Birula R, Woźniak Z, Baran E. Pachydermatous eosinophilic dermatitis. Acta Dermatovenerol Croat 2011;19:31-5. Helbig G, Wieczorkiewicz A, Dziaczkowska-Suszek J, Majewski M, Kyrcz-Krzemien S. T-cell abnormalities are present at high frequencies in patients with hypereosinophilic syndrome. Haematologica 2009;94:1236-41. Klion AD, Bochner BS, Gleich GJ, Nutman TB, Rothenberg ME, Simon HU, et al. Approaches to the treatment of hypereosinophilic syndromes: A workshop summary report. J Allergy Clin Immunol 2006;117:1292-302. Alfaham MA, Ferguson SD, Sihra B, Davies J. The idiopathic hypereosinophilic syndrome. Arch Dis Child 1987;62:601-13. Peros-Golubicić T, Smojver-Jezek S. Hypereosinophilic syndrome: Diagnosis and treatment. Curr Opin Pulm Med 2007;13:422-7. Hui CK. A case of dermatopathic lymphadenopathy associated with hypereosinophilic syndrome. Ann Acad Med Singapore 2012;41:35-6.